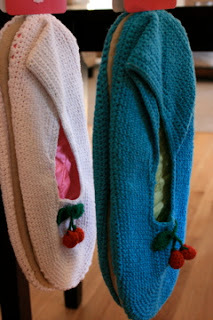 Crocheted slippers with little cherries on top. Are these so Anthropologie or what?? The only difference is that these were 5.99 and at Anthropologie something like this would be 59.99! Okay so I'm exaggerating a little but you get the idea. How fabulous are these? I stocked up on a few for gifties. You can find this "Fun Find No.2" one aisle over from the socks and tights.